My munny for Kidrobot and Toitoy's I want your Munny show. with pale skin and raven curls. a ghost loved her with all his heart. I am so happy to be a part of Illustrious at Compound Gallery with the talented Martin Hsu and Nimit Malavia. My lovely friends brought me the Sweet Illustration book. It's so pretty, yay. 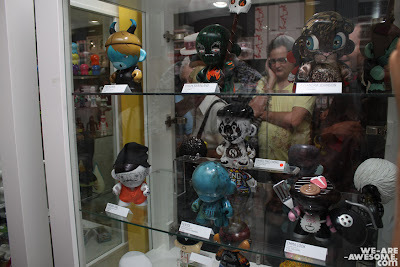 A photo from the sifting through the madness show at Salon 91 Gallery. Gabrielle Raaff, Senyol, Candice Jezek, Jade Klara.